Please browse around the site and discover more about us. 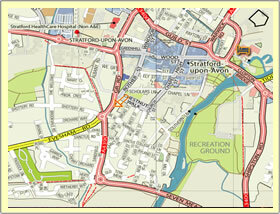 To locate a map of the area go to www.streetmap.co.uk and enter our postcode CV37 6HT. or click on the image above. The arrow that appears is virtually pointing directly at Penshurst. 1.Coming from the South via the M40, from the North or the East? a).Having left the M40 at junction 15 you will enter Stratford on the A46 and pick up the A3400. b).As you approach the town on the A3400 you will see a large Tesco store on your left hand side. Carry straight over the next 2 islands and then turn right at the traffic lights towards the racecourse. Carry straight over the next set of traffic lights into Grove Road. Continue for around 500 metres past the park and you will see our guest house on the left hand side just before another island. 2.Coming from the South via the A3400? On approaching the town you will come to the first island. Turn left at this very first island towards Anne Hathaway's cottage. Take a direct right turn at the next 2 islands. On exiting the 2nd island you will enter Evesham Place and will see our house almost immediately on the right hand side. 3.Coming from the West or South West via the M5? Leave the M5 at junction 9 and follow directions towards Evesham on the A46 and then pick up directions for Stratford. You will come to a large island about 4 miles past Evesham. It is important at this point to cease following directions to Stratford and instead to leave this island at the 3rd exit on the B439 towards Bidford. Carry straight through Bidford and you will enter Stratford about 6 miles further on on the old Evesham Road. Carry straight over the first island on approaching the town and you will see our house almost immediately on the right hand side. 4.Coming from the North West? Pick up the M42 and the M40 in preference to the A46 and then follow directions as in 1a). above. If you do find yourself coming into Stratford from the West on the A46 continue around the town on the A46 until it joins with the A3400 and then again follow directions as in 1b). above. On leaving the railway station, you will immediately see a set of traffic lights ahead. Turn right at these lights into Grove Road. Continue for around 500 metres past the park and you will see our guest house on the left hand side just before another island. It is an easy level walk of around 10 minutes and unless you have very heavy luggage you would not require a taxi. You willl usually be dropped off behind the Leisure Centre. Follow the road towards the town centre and then walk straight up through the main shopping streets as you see them appear. At the top of the first shopping street carry straight over the small island and then at the end of the next shopping street turn left at the tall free standing clock tower. Continue for around 500 metres, passing the Civic hall, the Police Station and the park on your right. You will see our house on the left just before another island. It would take about 20 minutes on foot.